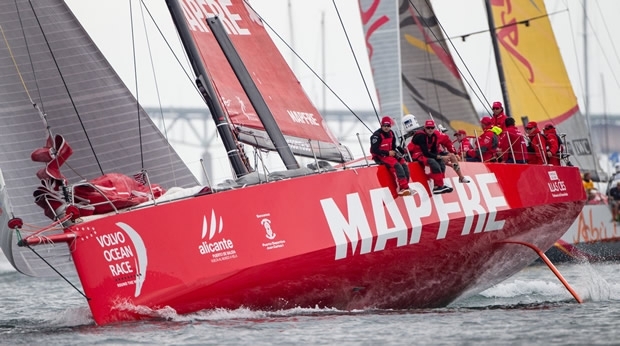 MAPFRE, with Iker Martínez back on board as skipper dominated the Team Vestas Wind In-Port Race Newport today, leading from start to finish to claim their first victory in an in-port race. The Spanish team grabbed a narrow advantage at the first mark, but was chased all the way by the home team, Team Alvimedica which secured second place on the podium, but never really threatened MAPFRE. Racing was held in light winds and was predominantly straight-line sailing with almost no opportunities to pass. “We are improving slowly and that’s the way we want to do these things,” commented Martinez. “Today we were first and we’re feeling super good." The Ian Walker-led Abu Dhabi Ocean Racing landed the final place on the podium - its 12th from 13 starts - which has now put into the lead of the overall In-Port Race rankings, displacing Team Brunel, which suffered an uncharactistically poor start and seemed destined to bring up the rear until finally edging out Dongfeng Race Team to take fifth. Walker's UAE team had to fight their way through from the back of the pack. MAPFRE's victory today means that, with the exception of Team Vestas Wind, every team in this Volvo Ocean Race has won an in-port race at least once. DNS. Team Vestas Wind (Denmark) 8. 7. Team Vestas Wind 52.